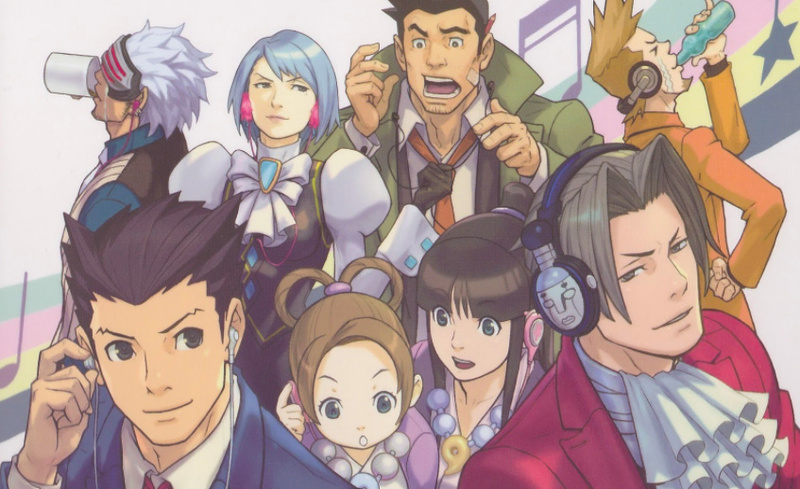 A few days ago we reported on the news that Capcom had pledged further software support to the Nintendo Switch, with the beloved Ace Attorney series getting a mention as a future release. Kotaku UK has apparently spoken to two sources which have given more detail on exactly what these plans involve. First up, it would seem that Capcom is preparing to bundle up past Ace Attorney games in two different collections, due for release some time between April and October next year. The first collection, it is said, will feature the opening three games in the series, while the second will contain episodes four, five and six. All of these title are already available on smartphones with HD graphics, which should make the porting process quite straightforward. However, according to Kotaku UK, these collections are merely the appetiser for a larger release - a fully-blown Ace Attorney outing with Phoenix Wright returning in the lead role. This is expected to launch towards the end of 2018. Without any futher evidence we can't possibly say that this rumour is true, but it would certainly make a lot of sense - the Ace Attorney series has been incredibly popular over the years on Nintendo systems and would be well-suited to the Switch's touchscreen. Let us know what you think of all of this by presenting your case below. I'm up for anything Ace Attorney on the Switch. I've only played the DS games but I'd probably get them again in a collection for the Switch and a new game is even better. The problem is, if this is true, i have these games (1-4) on the original DS and then from the e-shop on 3DS. I won't object (see what i did there) to triple dipping, but if they pull another Street Fighter 2 on us and charge 35 quid, then it might have to be a no. It needs to be budget price. Get in. Great news if true. Hold it!! That's great news. However I don't think the series is that popular in the west. If it was we would have retail releases or even the translation of prequels. Also isn't Apollo supposed to come out this week? "with Phoenix Wright returning in the lead role"
Admittedly I'very played them all before, but I'm pretty sure enough time has passed to play through them again with a certain level of ignorance. Actually I wonder how it would be to play along with my Nephew on a big telly? Never really thought if you could play AA in a communal setting, but it could work. Hope it's a retail release not download only, like the last few. Hey Capcom, how about porting over the games that never made it to the West in the first place? Investigations 2 (in a collection with 1), and the 2 Dai Gyakuten Saiban games would be nice and something new for a change. With how godawful the first trilogy looked in HD, and the likely hood of being charged more than their mobile counterparts, physical retail being damned ever since the 3DS (except Japan), the lack of effort into localizing the spin-offs (DGS1+2 included), and a rather disappointing downhill trend with the second trilogy I'll be giving these supposed compilations a hard pass. They really need to get their crap together with the Ace Attorney series. @cambotero That was Namco Bandai wasn't it who said that? Wish they'd meet the detractors* of their hit-and-miss "remastered" Vector Magic art halfway, and add a mode for displaying the original sprite art... stretched resolution bedamned. How about the Disney afternoon collection? Never played these games so would definitely be interested in picking them up. I hope this is true and I’ll blindly buy any Ace Attorney they put out, but I was hoping the second complication would have Investigations 1/2. Although HD SoJ would be perfectly fine as well. Oh I LOVE the idea of a collection of the games! I never played the first few games and didn't want to jump in without knowing the story. If that is true I will totally pick them up! I only played the first game on DS back in the day and honestly didn't like it. That said, I guess I'd be game to give the series another try. Yeah that's Namco who mentioned three upcoming games. This could be great news if the collections are well-priced. I'll be happy to see the series establish a presence on the system, either way. The only objection here is from my wallet and he can shut up as I'll definitely double dip on a bit of phoenix wright. Now if we can just get Level-5 to drop the Layton games on Switch. I would be in heaven. HYPE! I definitely will buy the original trilogy just so my siblings can play them. I have 4, 5, 6, but I'm still considering it since I don't want to pass my 3DS around. I hope this is true! It will make my niece very, very happy. Might even dip into this series for the first time, as well! ......I would rather have Monster Hunter! Well, I'm not double dipping. I love Ace Attorney but I don't need to play these kind of games more than once. I remember each case and its plot twists so there wouldn't be much of a surprise element. Besides I think the original DS games look charming. Was a classic on the DS. "OBJECTION". But capcom need to bring out Powerstone for the Switch (secretly praying). If they get a 3d makeover option or redo the graphics for the first 3 eh, I'll double dip. Again one of the many titles that I have never played due to having had only a PS4. I would be happy to play the ported ones until a new one is released. @datamonkey Ace Attorney is an amazing game. Did you PLAY the last DmC? I own the Ace Attorney collection for my 3DS but I never got around to playing them, having with ability to play on the Switch is much more enticing to me with that sharp hd screen. Never played these games for some reason. A switch release would change that I reckon. If the price is righ that is. I already have the entire series in Japanese and English but I will totally double dip....or is it triple dip? (digital this time though unless the box art is fantastic). Capcom better start bringing their A games to Switch now, there's no ignoring the Switch this time. The money are there and no one wants to stay at home with their PS4 and Xbox One all the time. I used to love Ace Attorney, but the new trilogy fell flat for me. I would double dip on a collection of the first three, but I already have Dual Destinies and haven’t even started it. Maybe I’d get the second trilogy to play it soon and get it out of the way. Now, a new game with focus on Wright would be great! No objection to this! My Switch will have a high-capacity micro SD by then. I probably won’t get a collection game of them since I still have the main ones on DS. I’ll take the new game though. How about a collection of ALL the games? Surely they're not very heavy? I'll get the new one for sure. I love these games! @Dpishere I have a couple of them on my backlog on 3DS. But in my case, screen resolutions has zero to do with me playing them. It's having quality TIME to invest on them. They require you to pay attention at all times. So they're not like the Michael Bay type games where you can go on autopilot through most of 'em. If it will come in retail form, (which I somewhat doubt at this point) I'm all in. I might get digital if it's like $20 for each collection, but otherwise I won't be bothered. I like to own my games, not rent the license for 5 years until I can no longer download the games I bought. @MrGawain go for it. My brother and I play it togetherish. I read the dialogue out loud, and he and I work together to figure out the trials. Sometimes one of us remembers a detail the other forgot. Well damn.. I already bought them all on the original DS and then again on the 3DS and then on two phones xD but you know what? You can never have too many Ace Attorney copies! Switch it is!